A fatal crash is being investigated this evening in Mississauga. Sgt. Kerry Schmidt of the OPP reported that five vehicles were involved in a collision on the QEW eastbound, east of Cawthra Road. One person has been pronounced dead. 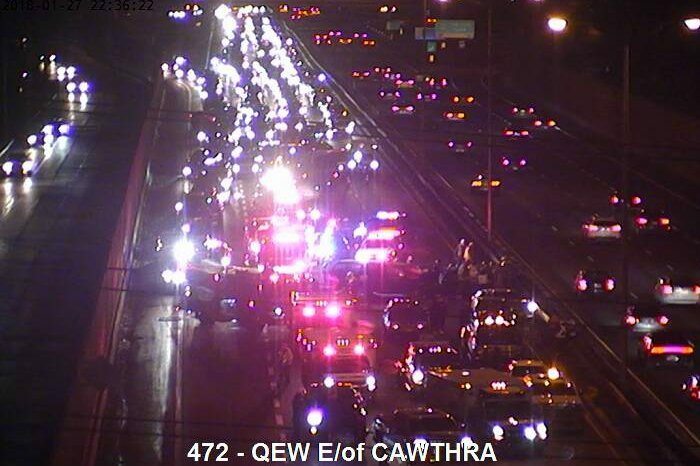 Currently the QEW eastbound is closed at Cawthra Road. Other drivers should avoid the area for now. UPDATE: Police have reported that there actually was no fatality as paramedics were able to get a pulse on the patient, who is now being rushed to hospital. Several other patients are dealing with injuries at this time. UPDATE: The patient has succumbed to her injuries.